Photoshop CC 2015 was released on 15 June 2015. Adobe added several features including Adobe Stock, which is a library of custom stocks. They also added the ability to have more than one layer style, for example in the older versions of Photoshop you could only have one shadow for a layer, but in CC 2015 you can have up to ten. Other minor features like Export As, which is a form of the Save For Web in CC 2014 were also added. CC 2015 also marks the 25th anniversary of Photoshop. To download Photoshop CC 2015 you need to login here first. Essentials, Motion, Painting, Photography and Typography modes. *The test for this submission involved the creation of a few .PNG icons making use of almost all the 2D features. 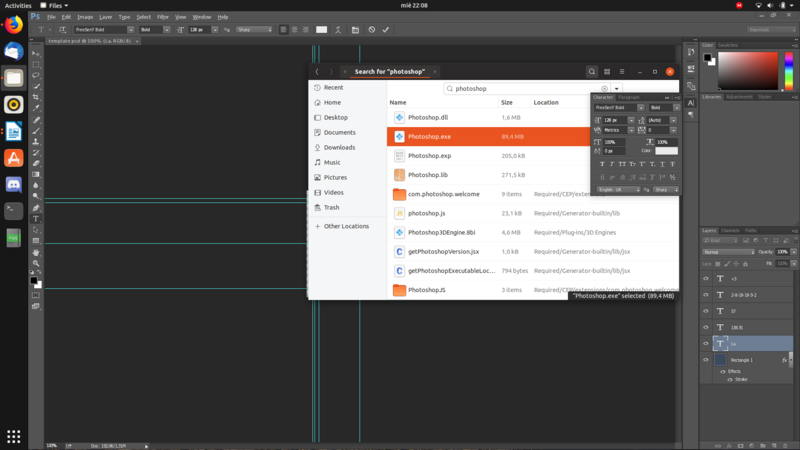 Photoshop CC 2015 should work as well, as a native Linux graphics tool like the GIMP, for this version of Wine. Export as... feature keeps loading for a long time, relatively speaking. Some Photoshop windows are shown at the top Z-order, of the screen. This was despite having another application as active. In order to avoid Export as... loading long time, I recommend to use the Save as option with the extension desired, because it works as good as in Windows. Hiding the Photoshop windows that are shown at the top will do the trick in order to solve them being at the top. (Minimizing Photoshop won't do the trick). Please create bug report with description of the problem, tablet model and logs from wine. I've tried this with many different wine versions including the setups mentioned above. The install works great, no problem. Then, I run the program (in Win8 mode) and try to sign in. It tells me that there is no internet connection or that my clock is set wrong, and times-out. I can't get any further than this. I have checked the internet connection is working using IE in the same wine environment. I figured the clock would be sync'ed automatically from the computer. Has anyone else run into a similar issue? Please let me know! Thank you! Are you wifi or eth connected? Yes. I'm connected by wifi, and I have tested iexpolorer on the same wine instance, and I can connect to the internet, no problem. I may be missing something though. Please let me know if my testing methods are no good. Hi, do you found a solution for that ? How do you download this? With your provided link it says access denied. And can you provide some sort of guide how to install this? Can you crack this Photoshop if used with PlayOnLinux? You need to create an Adobe account, log in, and download the trial. And if you want to keep using it, buy (subscribe) it. It's pretty cheap. Don't use cracked software please. If you are not willing to pay a few bucks a month for Photoshop, then there are free alternatives, like Krita if you want to paint, or GIMP if you need a general image editor. When I open a picture or a file, I get some glorious graphic bugs. Wich config do you use ? Hi. The installer opens as intended but I'm stuck on the "Sign In Required" screen. The login form is never loaded and the loading spinner just keeps spinning until the connection times out and I'm presented with a "Please connect to the internet and retry" screen. Any ideas on how to solve this? SO just from this point of view i would be glad to understand if author use win32 or win64 and HOW (step by step) did author do to make it work under 64 architecture. because such program like photoshop in 32bits is USELESS. The program PDapp.exe has encountered an error a serious problem. Install Creative Cloud in Windows XP mode. It'll fetch the legacy Adobe Download Manager. Once it's installed, quit out and restart in Windows 7 mode. This should give you access to current Creative Cloud applications in the old launcher. Some dialog boxes (New,Blending Options , Preferences etc) don't display correctly. Buttons are displayed as black boxes. Graphical errors like described by Harindu Dillshan are mostly related to gdiplus library (this is a case, for example, in Adobe Premiere Pro CS3). If someone can specifically rationalize the reason for installing msxml3 msxml6 vcrun2005 vcrun2008 fontsmooth-rgb, please go ahead. Otherwise I take suggestions of installing those as irrelevant disinformation which should not be repeated to the users. How to fix fonts on photoshop when splash is runing on the screen and on app? it's simple tested on plasma 5.4.3 / lxqt / gnome-shell. sub-pixel (rendering type): RGB, Hiting style: Slight. On mate in linux mate won't work. All test work on Archlinux. Edit: On Mint Mate won't work. All test work on Archlinux. If you set your wine to Windows 2008, Photoshop CC 2015 will install. Then, set it to Windows 7. Unfortunately, it still won't work. I'm stuck. Change wine to Windows 8 after installation . It worked for me at least. I confirm, works fine with Windows 8 after installation.